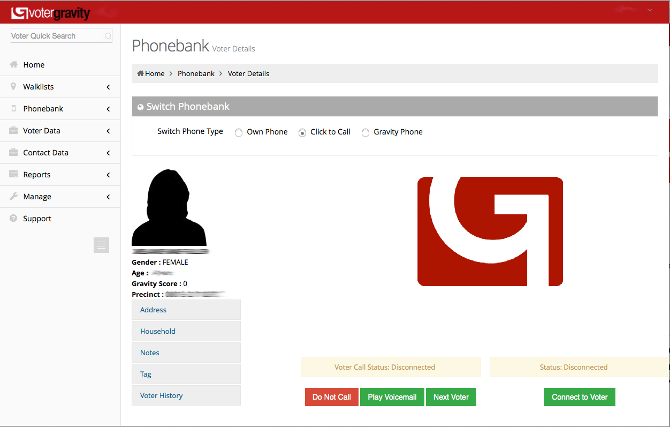 Own Phone: ideal for campaign phone banks with prepaid wireless or traditional basic landlines. When you are ready to begin calling voters, login to Voter Gravity at http://portal.votergravity.com. Your campaign's coordinator will provide you login credentials. You should now be at a screen like the one below. If not, navigate to Phonebank > Start in the left navigation. 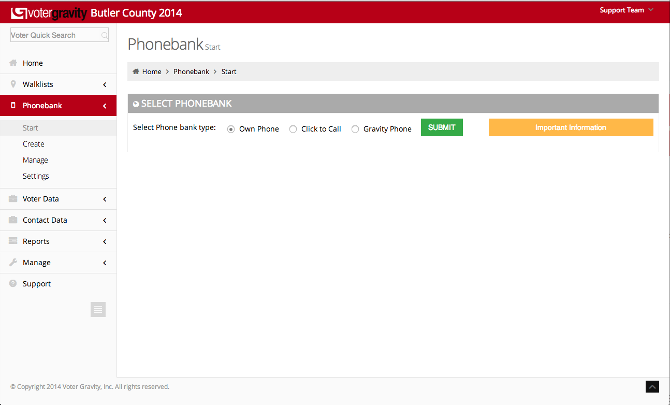 Select the Phonebank type you would like to use and click Submit. You can switch at any time during a phonebank session. If you do not see Dial In or Headset, this means that the campaign you are working for has not enabled these features. NOTE: Once you select a phonebank type and click Submit, be prepared to begin calling voters immediately. After clicking Submit, you will see a screen with information about the voter on the left and the survey on the right. Call controls will be below the survey. When using Own Phone mode, the only purpose of Voter Gravity is to input results of surveys from voters you reach. To call voters, simply dial the number on the screen on your own cell phone or landline. Typically this is when the campaign has phones available for volunteers. * Dial In and Headset modes use VoIP technology and are an additional charge.